What: Passkey is a bookmarklet (Firefox and IE) which lets you quickly authenticate as a CU person, when you're off-campus. This allows you to access resources restricted to Cornell users only. In Internet Explorer, right-click the icon, add to favorites. The next time you're off-campus and a publisher asks you to log-in, click the Passkey. You'll be prompted for your CU netid. Welcome to the Mathematics Library! 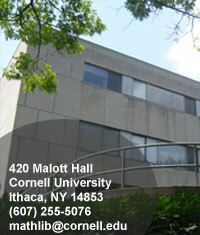 Welcome to the Mathematics Library at Cornell University. This guide will help you navigate math library materials most helful for mathematics students and faculty. Access our collections online here. Holds If the item you want is checked out, and you are willing to wait an extended period of time to borrow the item, place a hold on it in the catalog. Recalls: Request a checked-out item be returned and sent to you within two weeks. Book Delivery Service: have books from one library delivered to another library, free. InterLibrary Loan: borrow items from around the world using one simple request form. Borrow Direct: a rapid request system, Cornell is partnered with many other Ivy League institutions' collections with this service.